UCLA knew what it was facing in Khalil Tate. 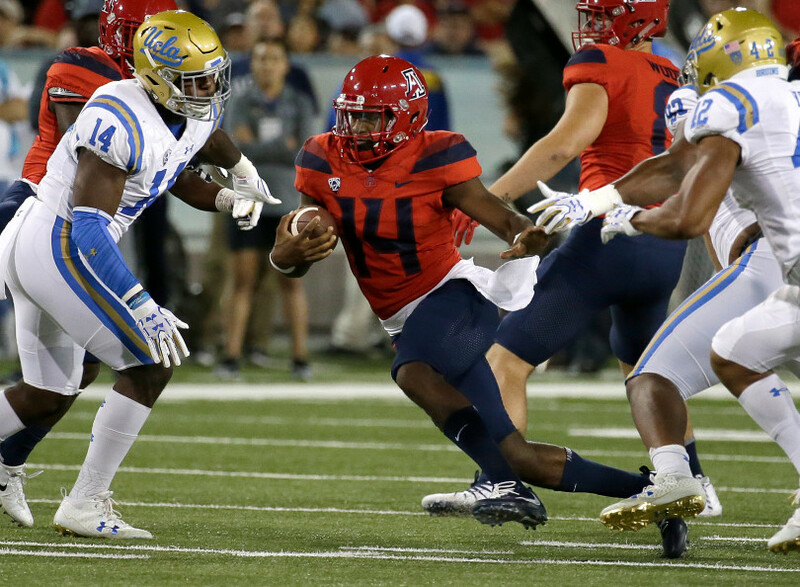 Yet the Bruins didn’t have any answers for the Wildcat quarterback as he piled up 230 rushing yards while leading Arizona to a 47-30 win over UCLA at Arizona Stadium on Saturday. Jim Mora suffered his first loss to the Wildcats in his UCLA tenure. The defense gave up 605 total yards, the most in a single game since 2014 against Arizona State, and UCLA dropped to 3-3, 1-2 Pac-12 at the halfway point of the season. With the way the Bruins secondary has performed (Denzel Fisher and Nate Meadors, in particular), why hasn’t Brandon Burton seen the field more? If Brandon Burton didn’t get moved to linebacker, he still wouldn’t be in line to replace Denzel Fisher or Nate Meadors because Burton was a safety and Fisher and Meadors are both playing corner. UCLA is deep at safety with Jaleel Wadood, Adarius Pickett, Will Lockett, Octavius Spencer and Mossi Johnson. Johnson especially has emerged in recent weeks and coaches are starting to give him more defensive reps based on the toughness and tackling ability he showed on special teams. UCLA is a lot thinner at linebacker than at defensive back, so that’s why Burton wouldn’t move back at this time. It’s possible that Burton may still need time to adjust to the position change he made during the spring or he may be dealing with a minor injury that’s keeping him from the field. Fisher was the target of three defensive holding penalties against Colorado when he came in to replace Darnay Holmes, who was ejected for targeting. That’s a problem. But he was replaced by Colin Samuel, who immediately got a pass breakup on his first drive. Depending on how he followed up that game in practice the past two weeks, Samuel could be in line for a few more snaps on game day, I think. Meadors has been the recipient of several pass interference flags, but he seems to be a sure tackler and Pro Football Focus had him ranked among the best Pac-12 cornerbacks after the Colorado game. So while he hasn’t been perfect, he’s probably not as bad as you’re thinking. After Khalil Tate ran all over the Colorado defense last week, Colorado safety Ryan Moeller told reporters he didn’t even know Tate’s number before the game. The sophomore quarterback in the No. 14 jersey is not going to enjoy that type of anonymity anymore after his 327 rushing yards set an FBS record for a quarterback last Saturday. Whether Brandon Dawkins reclaims the starting quarterback role or the Tate Show rolls on, the Bruins will have to deal with a dynamic running quarterback. Arizona leads the conference in rushing with 321.8 yards per game on the ground. 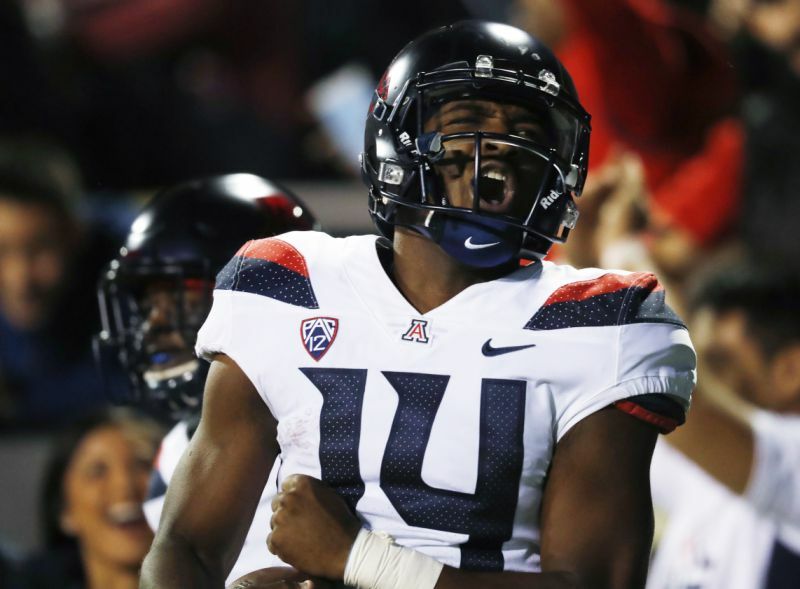 Dawkins and Tate combine for 47.9 percent of Arizona’s total rushing yards.